The Minnesota Hungarians 2012 Annual Meeting was held on November 18, 2012, where officers and Board Members were elected. Csilla Grauzer was re-elected for President, the new secretary is Bernadett Czettisch, and the new co-treasurer is Zsuzsanna Igyarto. Four Board Members were re-elected: Botond, Igyarto, Marta Matray, Al Nadosy and Tamas Szinyei. One returning Board Member is Sandor Gallo, who also will be the Chair of the Exhibit of the Festival of Nations. 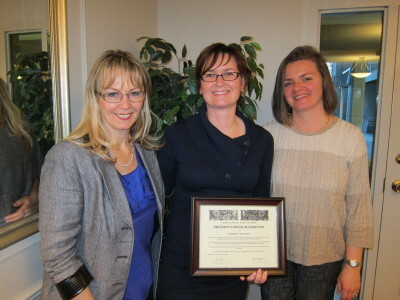 A new Board Member, Klara Hagymassy was also elected. Congratulations and welcome to all re-elected and new Officers and Board Members. 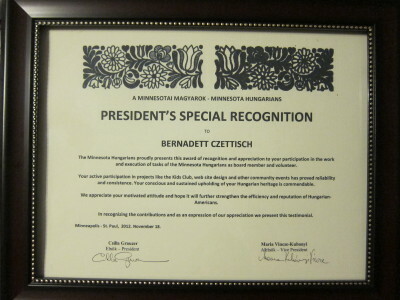 This year the Minnesota Hungarians honored Bernadett Czettisch with the President's Special Recognition Award of recognition and appreciation to her participation in the work and execution of tasks of the Minnesota Hungarians as board member and volunteer. Her active participation in projects such as the Kids Club, website design and other community events has proved reliability and consistence. Her conscious and sustained upholding of her Hungarian heritage is commendable. The Minnesota Hungarians appreciate her motivated attitude and hope it will further strenghten the efficiency and reputation of Hungarian-Americans.